This webinar was held on April 19th, 2018. Energy efficiency in homes and businesses is a way to improve the lives of women, particularly because women often are responsible for a greater share of the burden of housework and childcare. Additionally, women’s economic activities, particularly those in the informal sector, are reliant on heat intensive processes, where efficiency measures can mean an increase in income as well as improvements in labor conditions. This webinar aims to deepen the understanding on gender considerations in energy efficiency initiatives, as well as to highlight good practices in the sector. Edward Vine, Affiliate, Lawrence Berkeley National Laboratory. Presentation: Gender in energy efficiency: identifying gender considerations when evaluating SDG progress. This presentation will provide an overview of the gender and energy efficiency nexus and present recommendations for evaluators of gender in energy efficiency projects, and gender and inequity perspectives in project evaluation. Jiří Zeman, Freelance Consultant. Presentation: Gender and energy efficiency in Central Asia: examples from Kyrgyzstan. Jiři’s presentation will introduce the gender and social elements that need to be taken into account when developing energy efficiency projects in Central Asia. Additionally, it will share the findings of the 2014 UNDP/GEF project, “Improving Energy Efficiency in Buildings in Kyrgyzstan,” which is an example of how integrating a gender analysis into the project cycle can identify gender gaps and lead to the development of mitigation activities. Carol Mulholland, Specialist Master, Deloitte. Presentation: Gendered Health Impacts of EE Solutions: USAID’s Catalyzing Clean Energy in Bangladesh (CCEB) project. This presentation will focus on the CCEB project, focusing on how energy efficiency of improved cookstoves (ICS) have had a significant positive impact on women, who spend the most time with traditional cookstoves, by reducing the associated negative health impacts, while also helping reduced CO2emissions by 1 million metric tons annually. Dharesan Unnithan, Electrical Engineer, Energy Management Centre, Kerala. Presentation: Energy Clinics: women as agents of change in energy efficiency. This presentation will focus on the activities of the Energy Clinic, a 100% women-run energy efficiency program, implemented by the Energy Management Centre (EMC) in Kerala, India. The program focuses on domestic energy conservation and targets poor households. Advancing Gender in the Environment (AGENT) is a ten-year Public International Organization (PIO) grant to the International Union for Conservation of Nature (IUCN) that was established in 2014 and is managed by the Bureau for Economic Growth, Education and Environment’s (E3) Office of Gender Equality and Women’s Empowerment. The purpose of the grant is to increase the effectiveness of USAID’s environment programing through the robust integration of gender considerations, improving gender equality and women’s empowerment outcomes in a broad range of environmental sectors. AGENT provides an array of support for national, regional and global environmental activities to advance women’s empowerment and gender equality. AGENT’s support is designed to complement existing or emerging USAID environmental efforts. 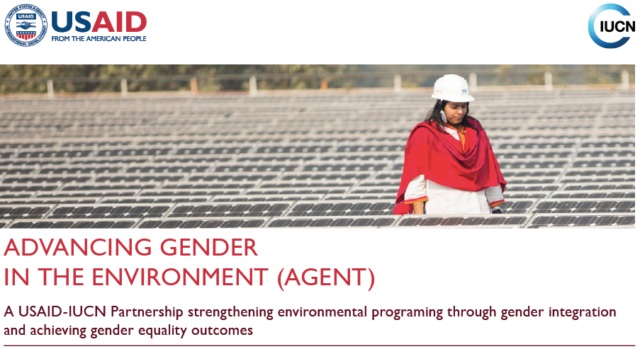 AGENT broadens the reach of technical support, builds evidence for gender integration throughout environmental sectors, fills critical information gaps, and develops targeted resources and tools that can be directly applied in Agency programs, training and communications. The information provided in this email is not official U.S. Government information and does not represent the views or positions of the U.S. Agency for International Development or the U.S. Government.